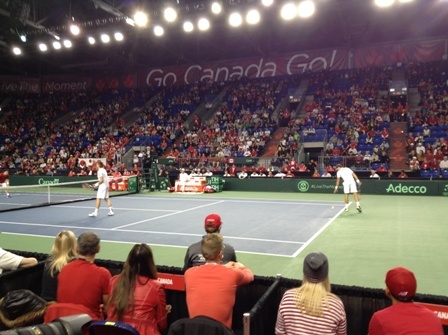 Daniel Nestor and Vasek Pospisil completed a historic win when they beat Go Soeda and Yasutaka Uchiyama 7-5 2-6 6-3 3-6 6-3 on Saturday at Davis Cup by BNP Paribas World Group first-round tie in Vancouver.By this crucial victory, Team Canada takes the lead 2-1 after Day 2 and moves one step closer to the quarterfinal, so close in fact that they can almost taste it. The one of the most anticipated matchup brought up immediately the biggest surprise of the weekend – and put an end to all speculation – when members of the doubles for Team Japan showed up on the court…without Kei Nishikori. The entire match was about changing momentums, unexpected turning points, up-and-down affair, where neither the more experienced Canadians nor the Japanese opponents were able to keep their chances alive from set to set. First Team Canada took the one-set lead by breaking at 6-5 in the first set by an amazing Nestor’s lob, however after that the Canadian doubles’ performance level had taken a drastic drop. Contrary, on the other side of the net, Soeda and Uchiyama rapidly came back with an early break in the second set. The scenario in the third and fourth sets was scripted on the similar fashion, early service breaks were the key factors to decide the winner of the certain sets. 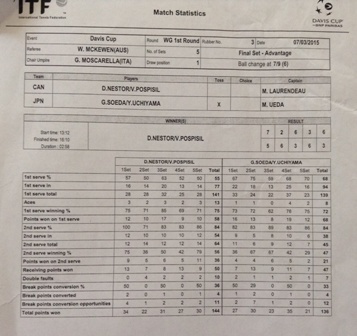 The two teams ended up with similar serving statistics, with Nestor and Pospisil winning 75 per cent of their first serve points, 56 per cent on their second serve, and going four-for-11 on break chances compared to 72 per cent for Soeda and Yasutaka on their first serve, 47 per cent on their second, and four-for-12 on break point opportunities. Nestor and Pospisil closed out the win by taking the last eight points of the match – breaking at love on Soeda’s serve to go up 5-3 before Pospisil served out the match at love. Canada never trailed in the contest and secured the win in just shy of three hours – at the two hour and 58-minute mark. – 87 years ago was the last time when Team Canada was a realistic chance to win in 5 sets and to take the lead but they failed. In addition to the success as member of Team Canada, Daniel Nestor rewrote some of his records. Now he played 22 years and he has currently 47 total wins at 48 ties (all of them are Canadian Davis Cup records). Canada now needs just one more victory to secure its place in the World Group quarter-finals for the second time in its history – first accomplished in 2013 with a 3-2 victory over Spain in Vancouver. The winner of this tie will earn a spot in the quarter-finals of this year’s competition and in the World Group for 2016, while the loser will need to participate in a World Group play-off in September in order to maintain its position in the elite 16-team category. Play will resume on Sunday at 1 p.m. PT with the reverse singles matches, opening with a hotly-anticipated battle between the two squads’ No. 1 players, Raonic and Nishikori in a must-win duel for the Japanese. The potentially deciding fifth match is currently set to feature No. 2 players Pospisil against Ito. The team captains have until one hour before the match to change their nominations. 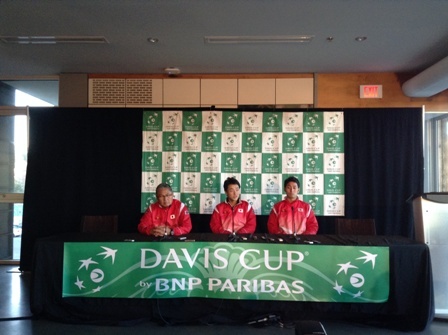 Minoru Ueda confirmed at his press conference, that he was the one who brought the final decision about the combination of the doubles team.